Paramo says:"The Torres Smock is an overlayering garment designed to provide fast block insulation when needed and pack down small when not. The moisture-repellent synthetic 133g fill delivers a high warmth-for-weight ratio, the down-like feel and performance continues to keep you warm even when wet. Styled for freedom of movement and generously sized to be worn over a Paramo jacket, this durable smock allows you to warm up quickly without removing layers." Fully-adjustable fixed hood with wired peak, insulated with 100g fill. Beard guard at top of front zip. Long front opening with two-way zip and internal storm flap for ease of access and venting. Short front to reduce interference with harness and movement. Gently scooped tail to protect lumbar area. Hem drawcord with single-pull, gloved-hand operation. Simplified cuff design and silky-smooth lining for speedy overlayering. Generously sized for overlayering with the Nikwax Analogy® system. Durable fabric and components plus sturdy construction make this a robust garment for regular use in all conditions. Can be treated with Nikwax TX.Direct Wash-In® to optimise wet weather performance. Working zipped breast pocket offering secure storage. Two internal mesh storage pockets to utilise body heat for drying and warming items. Insulated hand-warming kangaroo pocket, large enough for a map. Even for the ultra-fit, climbing hills and mountains can be exhausting stuff and, providing you keep on the move, it keeps you warm too. The problem is, once you reach the top and crack open the buttie box for a serious bit of view contemplating it is all too easy to get chilled. This is due to the lower temperatures at higher altitudes exacerbated by your sudden change in activity. Time to get out the Paramo Torres. This ultra warm smock slips easily over your head and over all your other garments to keep in all the warmth - and it works a treat. Windproof and stylish, this jacket is lightweight and packs down small. There is a generously deep zip at the front that opens about half-way with a pouch type pocket large enough to carry a map, gloves and hat. There is also a zipped breast pocket and two mesh pockets inside. The jacket is extended at the back to keep that all important lumber region warm and the excellent and volumous hood and face guard keep out the worst of the chill. Incidentally, this jacket also kept me toasty warm on a recent camping trip to the Lake District (temp circa -8�C) particularly during that all important tent to pub - pub to tent expedition. Furthermore the Paramo Torres is perfect for walking around town with just a simple base layer underneath. Whether you are at the top of a mountain, camping in the valley or just stepping out around town - the Paramo Torres will keep you nice and warm in style. 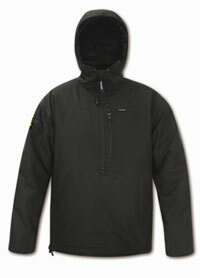 Moisture-repellent rather than waterproof - it cannot replace an effective waterproof jacket. The smock style may not suit everyone.